I did this cartoon logo as a tribute to my dad who was a New York City Firefighter for 20 years. His first fire house was Ladder 126 Engine 303 in South Jamaica in Queens, NY and they were know as the Princeton Street Tigers. He spent the first 14 years at that house and from the stories he used to tell me, that section of New York was terribly impoverished, full of burned out abandoned building and just plain dangerous in the late 60’s and early 70s and it wasn’t uncommon for people to throw things at the trucks as they were heading to an emergency. My dad ultimately became a Fire Captain and was unfortunately forced to retire due to injuries sustained in the line of duty. 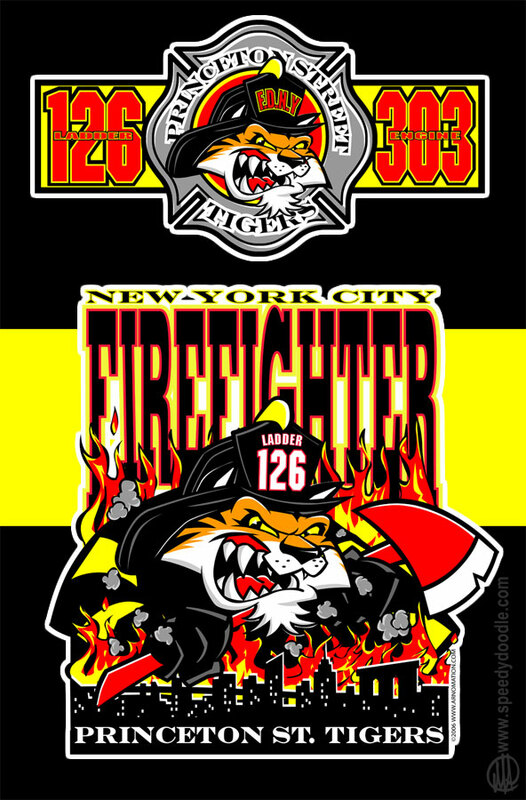 This entry was posted in Cartoon Logo & Character Design and tagged Cartoon logo, cartoon tiger, FDNY, Fire Dept. Logo, Princeton Street Tigers, t-shirt design. Bookmark the permalink.